Sometimes an outside-the-box product is exactly what a company needs to survive – and thrive. No custom boatbuilder in the western U.S. enjoys stronger brand loyalty, a finer reputation for taking care of its customers, and greater name recognition than Advantage Boats in Lake Havasu City, Ariz. 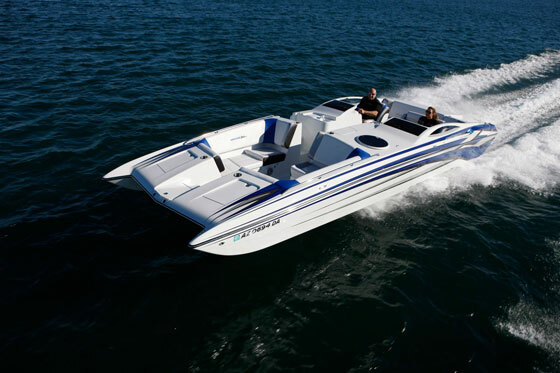 In addition to its line of 22- to 40-foot-long V-bottoms, the company’s Party Cat series started—for all intents and purposes—the custom deck-boat craze more than 20 years ago. But when the economy takes its worst dive since the Great Depression; when production and sales in the West Coast custom boat market all but evaporate, all of those things—noteworthy as they are—do nothing to pay the bills. And that’s a fair description of what’s gone down in the go-fast market in the past three years. 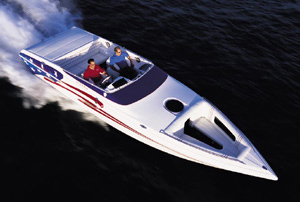 While the Advantage X-Flight might look like a catamaran—shown here is the 29-footer—it’s actually a V-bottom. Still, you could say that the team at Advantage Boats is lucky. After all, several of its competitors—one of them right down the street—have simply closed their doors. But you could also say that you make your own luck, and that, too, is true for Advantage, because in 2007 the company introduced a 27-foot model called the X-Flight. 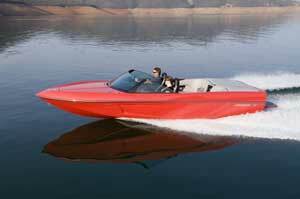 And in 2008 that boat won Powerboat magazine’s Sport Boat of the Year Award. 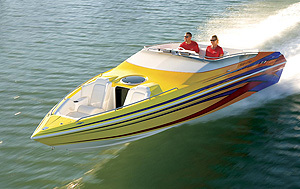 In 2008 Advantage followed up with a 29-foot version of the X-Flight, which looks like a catamaran at its “lift-creating” bow but actually is V-bottom—more on that later. 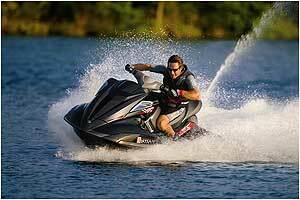 They earned Powerboat’s Sport Boat of the Year Award in 2009. The company added a 34-footer to the X-Flight Series in 2009 and might well have earned another award from the magazine had the publication not suspended its awards program, yet another casualty of the recession. The X-Flight’s unusual hull design enabled its designer to maintain an uncommonly wide open-bow area for a V-bottom. The drawings for the first X-Flight from Gary Ferguson, the company’s longtime designer, did not automatically convince Ray Camaro and Debbie Christensen, then company principals, that the boat needed to be built. In addition to its unusual hull configuration at the bow, which looks like a picklefork design that doesn’t carry all the way through the running surfaces, the model seems like a hybrid blend of sport-boat, deck-boat, and bow-rider, with an unorthodox automotive style windshield to top it off. 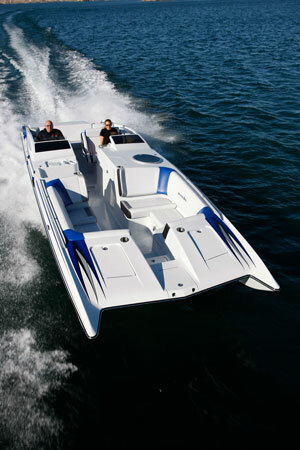 But strange as it sounds, put it all together and you get a stylish boat with outstanding functionality and versatility. And that turned out to be a very good thing, because according to Sepulveda the X-Flight Series has been “99.9 percent” of what has been built at Advantage since the first model was introduced. In the past three years, close to 100 X-Flight models reportedly have been built for buyers all over the country. Most recently, the company built one for a buyer in New York. Sepulveda credits the success of the model to a number of factors. 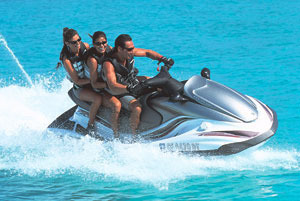 “The X-Flight gives people the catamaran look they like with the safety of a V-bottom,” he explains. 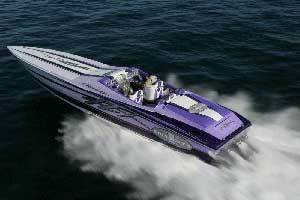 “One of things Gary has done with all our boats, and he did it with the X-Flight, is get them to run level. From coming on plane to top speed, they always run level. You never lose the shoreline. The cockpit the 29-foot X-Flight has a double-wide helm and cabin on the co-pilot’s side. Having tested all three X-Flight models as part of the Powerboat magazine test team, I can say in all candor that Sepulveda’s observations are spot-on. 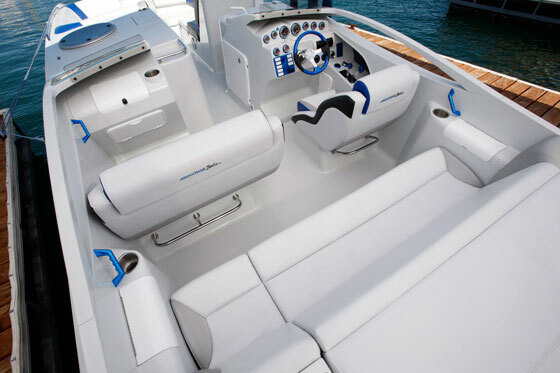 The boat handles beautifully, exhibits minimal bow rise at all times, and is efficient on relatively mild power—a pair of Mercury Racing 525EFI engines got the 34-footer to 91.2 mph. But what I like best about entire X-Flight series is the functionality of the layout. The cockpit is spacious, and on the port side of the 27- and 29-foot models, as part of the copilot’s console, there’s a large enough cabin for full-size adults to actually find useful. (On the average 27-foot mid-cabin V-bottom, the cabin is suitable for small children, wakeboards, and rodents.) Both models have walk-throughs to the open bow. The 34’ X-Flight has a full mid-cabin that is, quite simply, the most spacious and well-thought-out mid-cabin I’ve ever seen for a boat in this size range. Another plus of the catamaran-style hull up front is that it creates a wider open-bow area. In the typical V-bottom, the open bow spaces diminishes with the V-hull as it tapers forward. But the bow of the X-Flight does not taper—it’s as wide as it would be if the boat were a true catamaran-based deck boat. Of course, the people at Advantage would like to build and sell every boat in their model line. But until that happens, they’re grateful for the success they’ve had with the entire X-Flight series. The series didn’t just change the game for Advantage. It kept them in it. 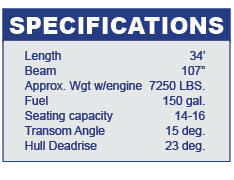 Editor's Note: Specifications shown are for the X-Flight 34. A 27 and 29 are also available. 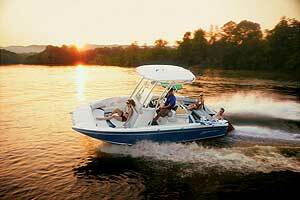 For more information, visit Advantage Boats.